Synthetic peptide within Human Giantin aa 425-475. The exact sequence is proprietary. Our Abpromise guarantee covers the use of ab174655 in the following tested applications. WB 1/2000 - 1/10000. Predicted molecular weight: 376 kDa. 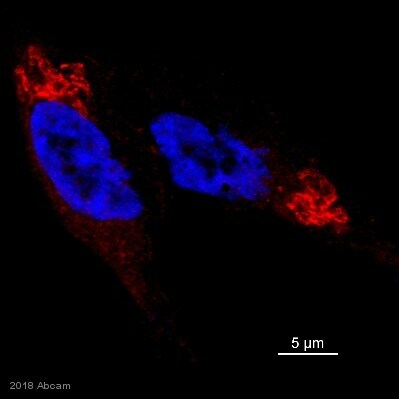 May participate in forming intercisternal cross-bridges of the Golgi complex. ab174655, at 1 &microg/ml, labeling Giantin in 293T whole cell lysate immunoprecipitated using ab174655 at 6 &microg/mg lysate (1 mg/IP; 20% of IP loaded/lane). ab174655 has not yet been referenced specifically in any publications. Publishing research using ab174655? Please let us know so that we can cite the reference in this datasheet.